Hikers pass close by a wild horse. On a recent Super Tuesday hike, eleven gentlemen hiked from the Cold Creek Bonanza Trailhead to Bonanza Peak, an approximately 2800 foot elevation gain. 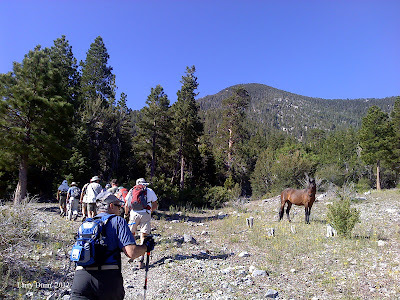 On an otherwise relentless climb up fifty something switchbacks, the hikers ran across around twenty wild horses. 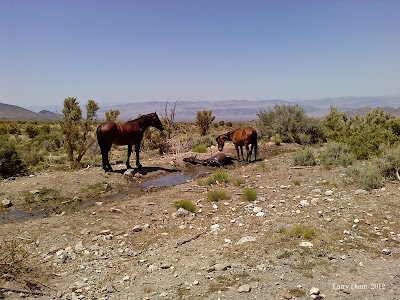 There were some horses in the Cold Creek valley but others were found actually on the trail. 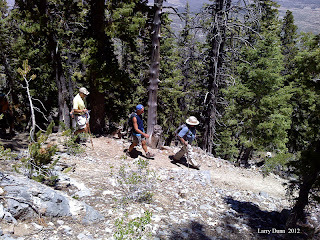 Larry D. took these photos of the hike and reports that he was allowed to pet the timid horse seen in the photo above. 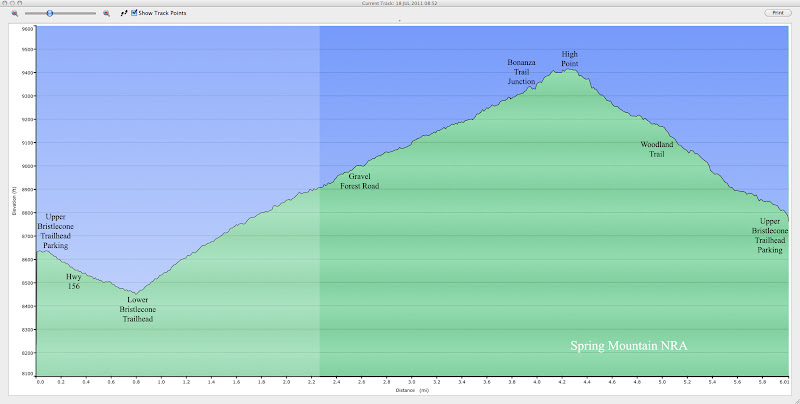 This 9 mile trek will be repeated in June at a slower pace. Be prepared for a climb! 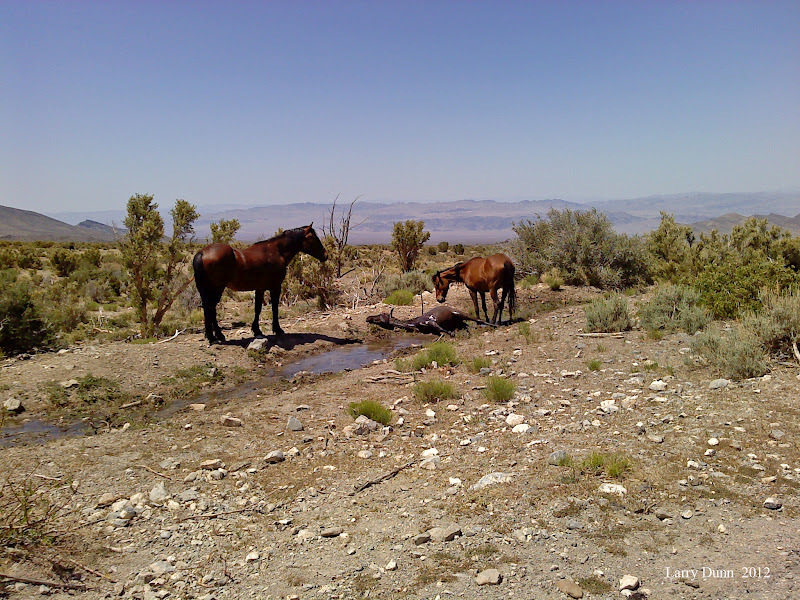 Hopefully, the wild horses which are always in the Cold Creek area will make another visit to the Around the Bend Friends. Two horses watch as a third youngster enjoys the mud. Oh, glorious day! 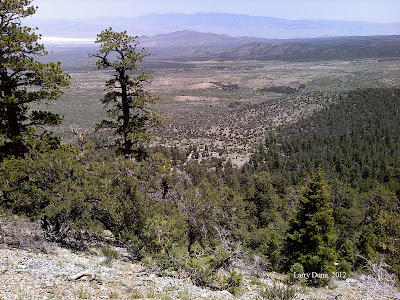 After the writer's road trip across the country to the East Coast, (literally ... as in, Hilton Head, SC), the hike on the familiar Bristlecone Loop in the Spring Mountains was like being back in heaven! The sky was so blue and the air was so pleasant, the writer kept wondering why she ever left. Well, family is important, too! 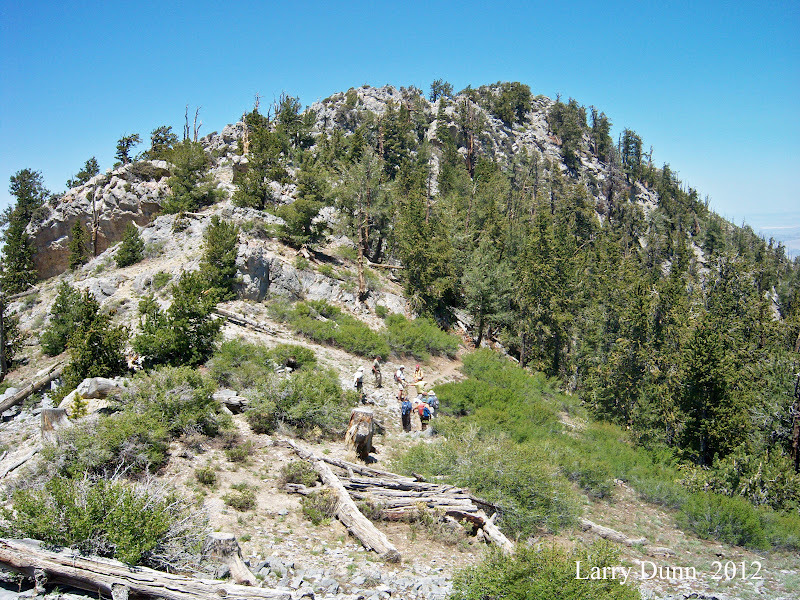 Eleven hikers participated in the six mile loop hike whose trailhead is located at the end of the Lee Canyon Road near the ski resort in the Spring Mountains. 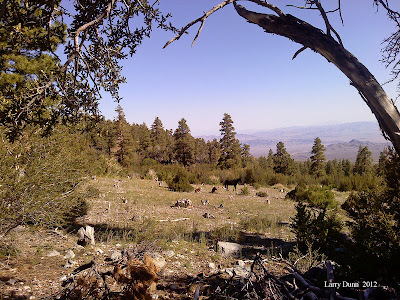 We parked and walked down the hill to the lower end of the Bristlecone Loop. Here, we found an old forest road guarded by a gate and a couple of dogs who were camping with their owners nearby. 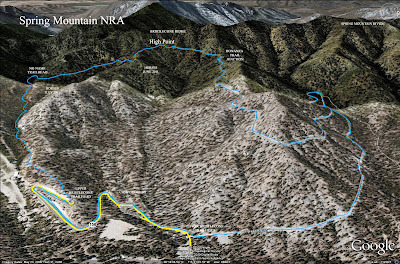 The first 3.5 miles of the loop are on the road which led the hikers gradually up from an elevation of 8450 feet to the Bonanza Trail junction at 9350 elevation feet. The sun was hot but the shade provided by some of the trees lining the road was comfortable. We made pretty good time on this part of the trail because we were anxious to get to the shade on the trail portion of the hike. One hiker found three new geocaches on our way. Mummy Mountain through the bristlecone trees. 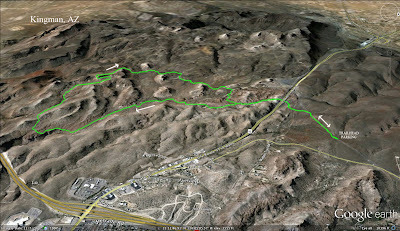 After stopping at the Bonanza Trail junction for our snack break, we continued up the road. Shortly, the road turned into a beautiful trail through the trees and rock with views of Mummy Mountain, South Sister and the ski slopes. There were very few flowers showing their blooms and we didn't see any wildlife such as deer or wild horses from the trail. The aspens had leafed out so the last half mile or so was under a canopy of light green as the sun shined through the bright leaves. There are still patches of snow covering the upper elevations of the park but a few more days like today and they will be history. We finished the hike and climbed back into our cars for the ride back, rejuvenated and relaxed. It was a hot day. 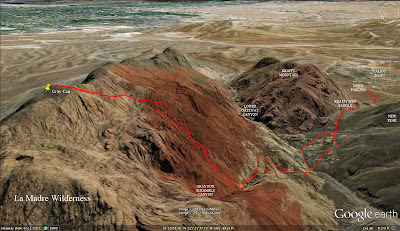 Luckily, nineteen hikers were on their way into Fern Canyon, a shaded bouldered canyon in the Red Rock Canyon NCA escarpment that almost always contains some amount of flowing water. 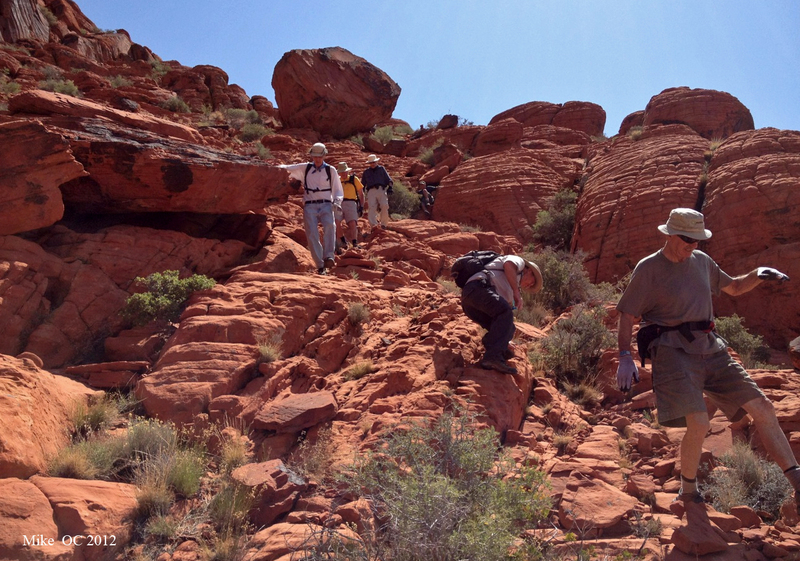 We arrived at the Pine Creek Trailhead on the Red Rock Scenic Loop and took off down the trail in great spirits. Ed was the head honcho today and the pace was perfect! 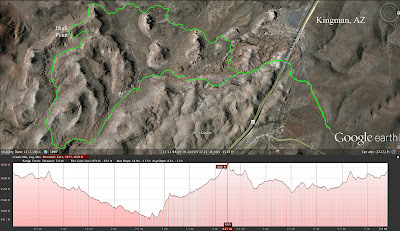 We swung by the old Wilson homestead ruins, and continued to the north fork next to Mescalito Peak. Already, the heat could be felt on our backs. We climbed up to our right and took the trail that soon dropped into the canyon wash where there were several small waterfalls flowing prettily through the boulders and trees. The shade was welcome and sufficiently blocking the expected intense heat. 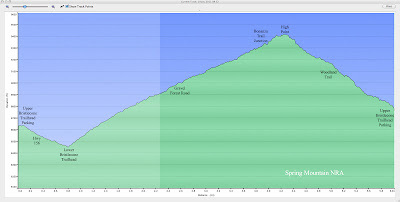 Other points of interest during the hike include Jacob's Ladder, a 15 foot boulder that offers ladder steps to gain its purchase; a large boulder that offers a 45 degree angle to test out your hiking shoe soles; a visit over to the right (north) side of the canyon to hike along the wall on a sandstone slab; and a few frogs in the various pools of cool water. Tadpole filled water above dripping twenty foot falls. The "end" of the hike is either at the base of a twenty foot waterfall, the area just above the waterfall, or the next shelf above that. 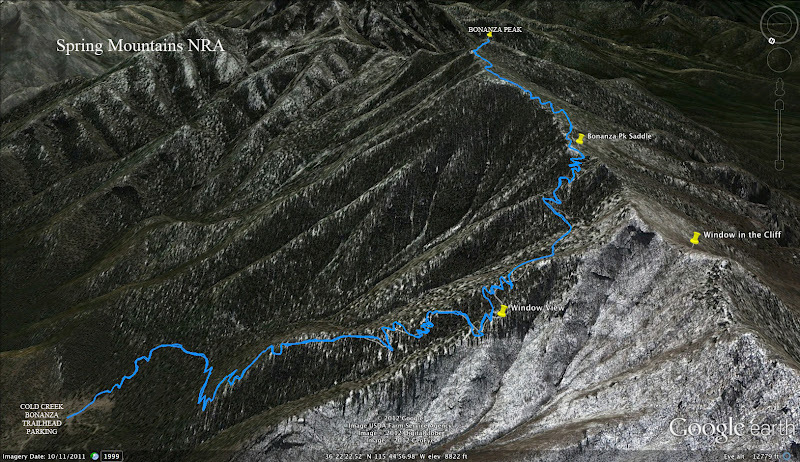 There is a trail that climbs up from the base of the waterfall found on the right side of the canyon. To get to the area above the waterfall, hang a left about midway up the climb where there is a narrow ledge that circles around the buttress. To get to the shelf, keep climbing! We took our break at one of these three places while we watched frogs and tadpoles. The canyon is a wonderful and relaxed place to spend an afternoon but, alas, we had to return to real life. 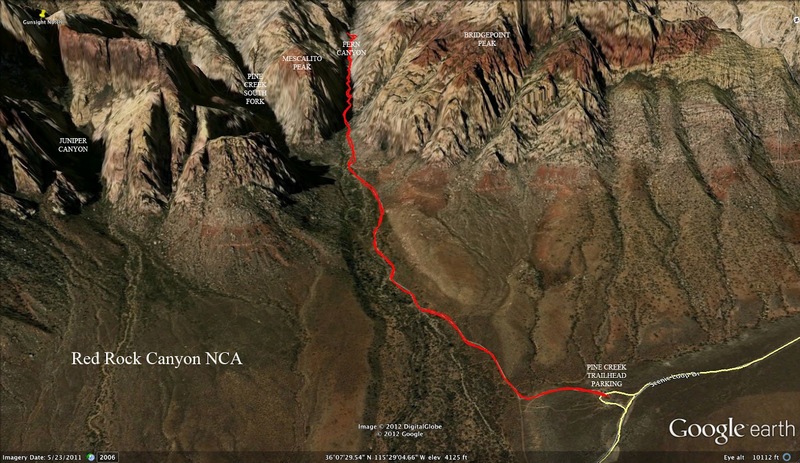 The journey out of the canyon was led by Don and Kay. Then Ed finished the hike in the lead as he took us quickly through the hot sun back to the cars. 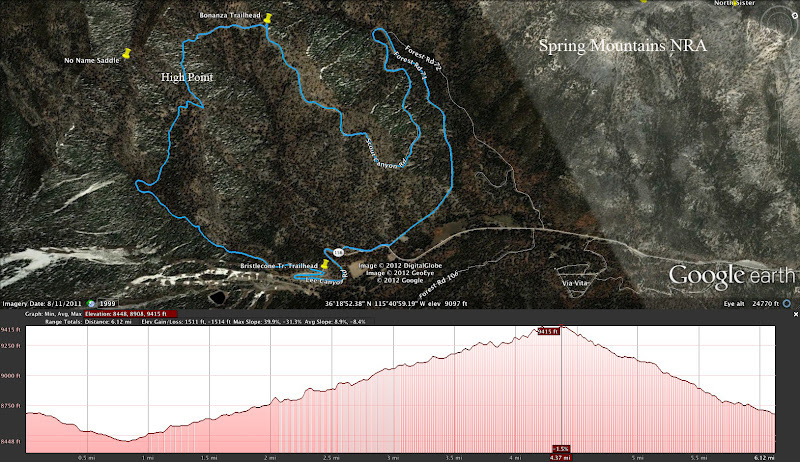 The hike was around 5.5 miles with around 700 feet in elevation gain. 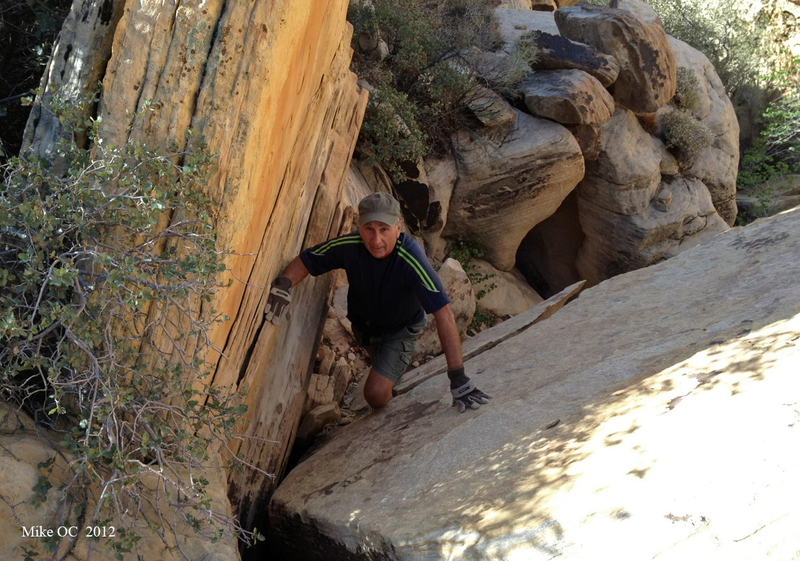 Scrambling back down the canyon. Fighting the vines in the "up and around" section. 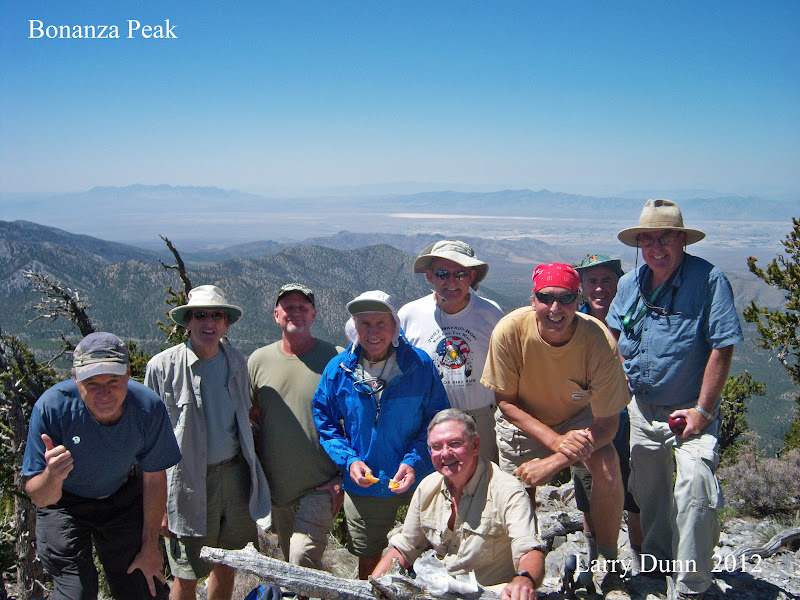 On Tuesday, yet another route to the peak of Gray Cap was explored by nine gentlemen. 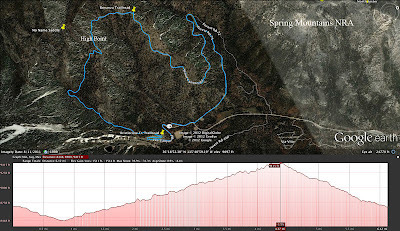 Mike OC gives us this abreviated hike summary. Kay, we ran out of cairns, but not faith. 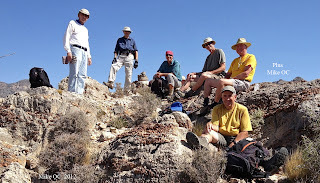 Nine of us persevered and finally set foot on the summit. 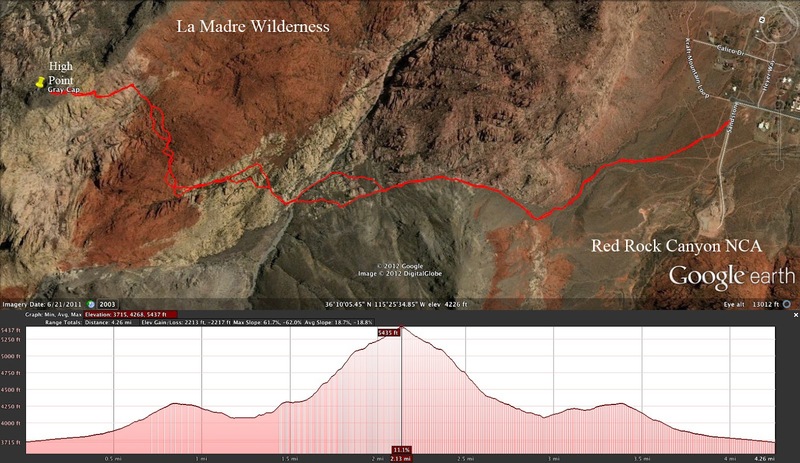 It was a variation of the route that we did earlier this year when we saw the lone fox. Remember? Once again, no distaff members, so testosterone ruled the day and the mountain. Thanks for the look into the adventure, Mike. 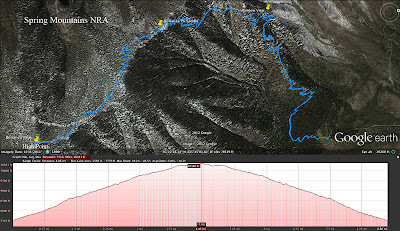 And, thanks also to Larry for the GPS information below. 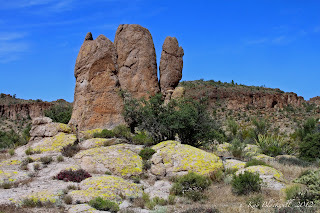 For the second day of the two day Kingman, AZ excursion, the Around the Bend Friends visited an area of bike and hike trails found near the junction of Hwy 93 and Interstate 40. 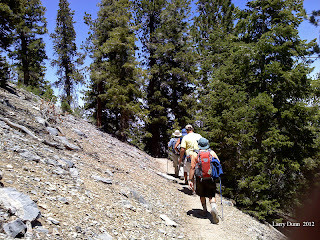 A larger group of twenty-two hikers went on a short 3.5 mile trail with tons of blooming flowers. A smaller group of five married couples (coincidentally!) 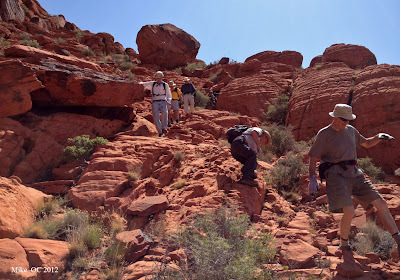 went on the Monolith Garden Loop Trail where, not only were there tons of flowers, but also rock formations galore! As this was a purely desert hike, we got out there early as it was to be a warm day with a small bit of wind. The hike began at a trailhead to the north of Hwy 93 but as we made our approach to the loop, we hiked underneath one of the highway's bridges. 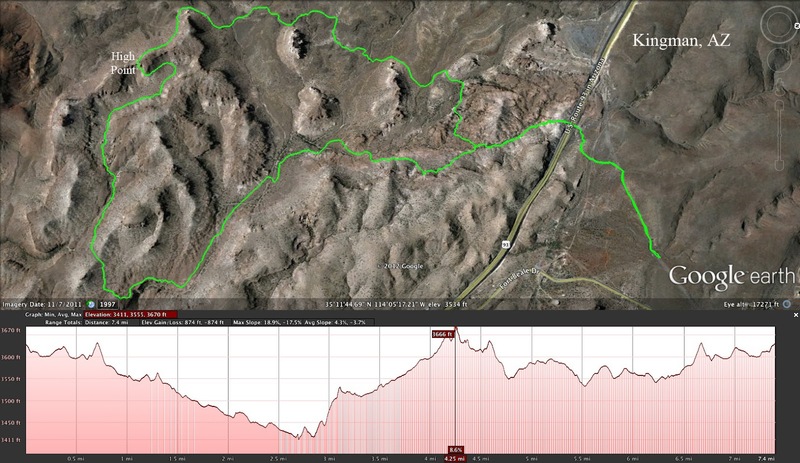 At around 3/4 of a mile, we reached the loop and turned left for a clockwise adventure into the beautiful desert. The trail was flat with very few places of elevation change over the course of 8 miles. The monoliths for which the "garden" is named were made of the same conglomerate as was found in the mountains of yesterday's hike. 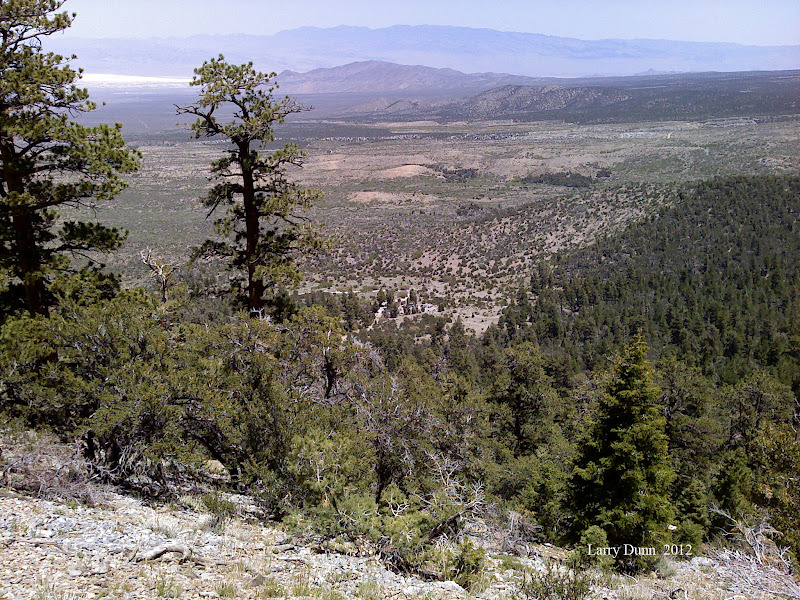 The tallest plants were "trees" of the ephedra family. Yes, Mormon Tea the size of joshua trees! 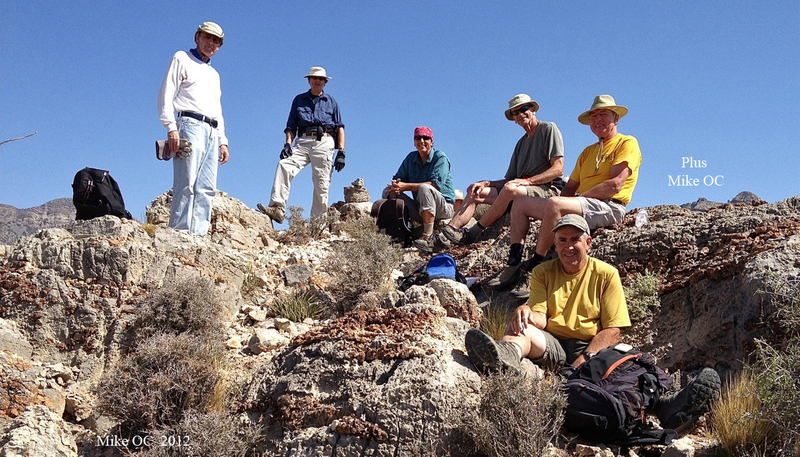 As we hiked, we enjoyed conversation and lots of photography. 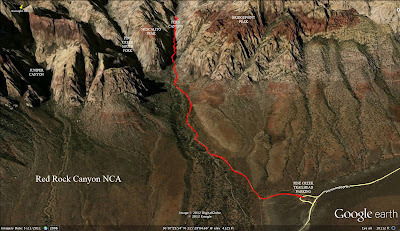 The trail took us through wide canyons and across open desert. To the left, there is a photo of a rock formation that we called either a turtle or a camel. (Or, a turtle that ate a camel....) Anyway, as we rounded one corner, we were surprised to see ocotillo plants. We don't have these plants in the wilds of Las Vegas. 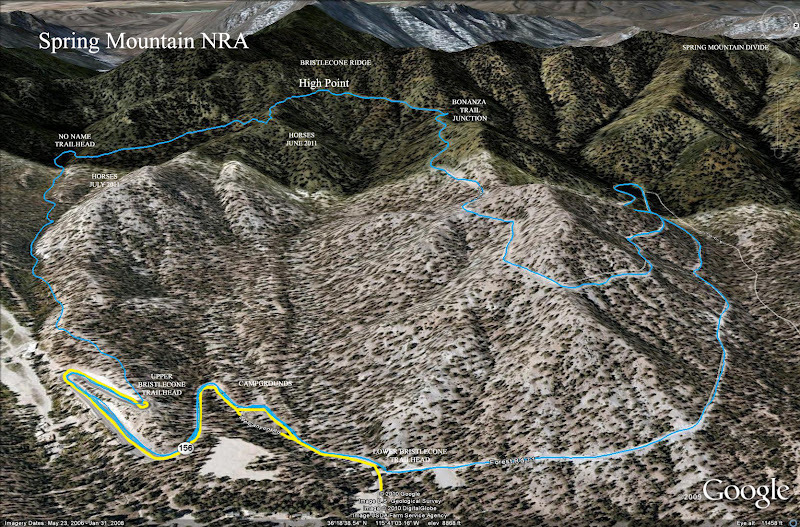 Several bicyclists were sharing the system of trails and passed by us a few times. 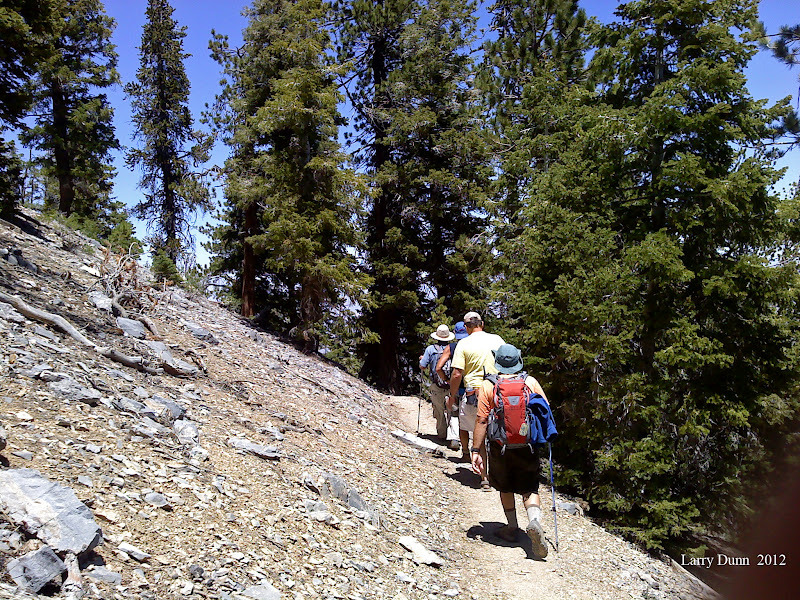 This part was familiar to us as we often hike on bike trails at home, too. Fouquieria splendens Engelm. is a desert plant of the southwestern United States and northern Mexico. 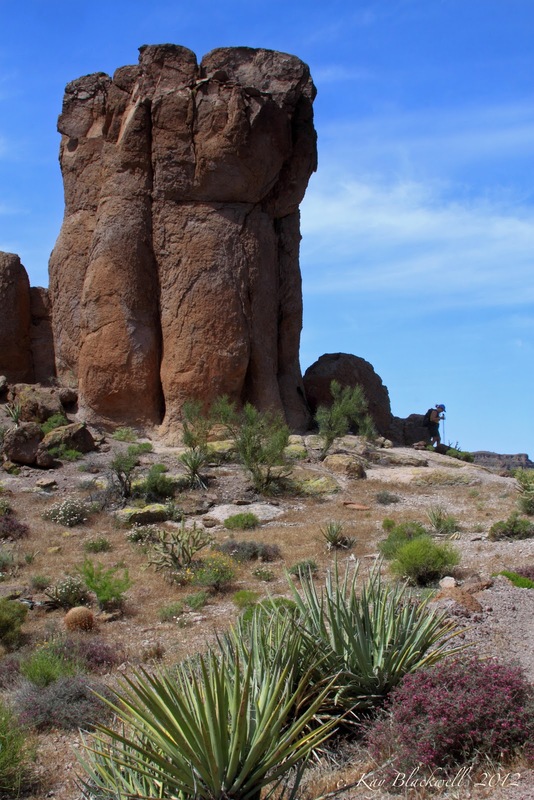 Common names include ocotillo, desert coral, coachwhip, Jacob's staff, and vine cactus, although it is not a true cactus. For much of the year, the plant appears to be an arrangement of large spiny dead sticks, although closer examination reveals that the stems are partly green. We took our break at the high point of the hike seen to the left, a saddle between wide canyons. When we started out again, we found a desert tortoise on the trail. She was headed up the hill toward her burrow found just below the row of rock. She wasn't too alarmed to see all those two legged creatures, she was just anxious to take the food that was in her mouth back home. For us, though, it was very thrilling. The tortoises are able to live where ground temperature may exceed 140 degrees Fahrenheit (60 degrees Celsius) because of their ability to dig underground burrows and escape the heat. At least 95% of its life is spent in burrows. There, it is also protected from freezing winter weather while dormant, from November through February or March. With its burrow, this tortoise creates a subterranean environment that can be beneficial to other reptiles, mammals, birds and invertebrates. 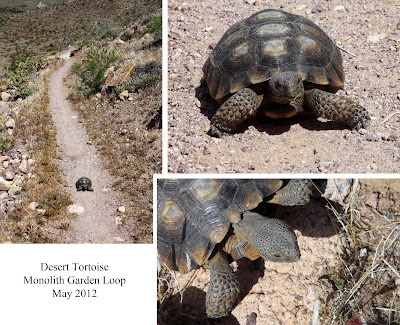 The desert tortoise is a herbivore. Grasses form the bulk of its diet, but it also eats herbs, annual wildflowers, and new growth of cacti, as well as their fruit and flowers. Rocks and soil are also ingested, perhaps as a means of maintaining intestinal digestive bacteria as a source of supplementary calcium or other minerals. As with birds, stones may also function as gastroliths, enabling more efficient digestion of plant material in the stomach. Much of the tortoise’s water intake comes from moisture in the grasses and wildflowers they consume in the spring. A large urinary bladder can store over forty percent of the tortoise's body weight in water, urea, uric acid and nitrogenous wastes. During very dry times they may give off waste as a white paste rather than a watery urine. During periods of adequate rainfall, they drink copiously from any pools they find, and eliminate solid urates. Adult tortoises can survive a year or more without access to water. 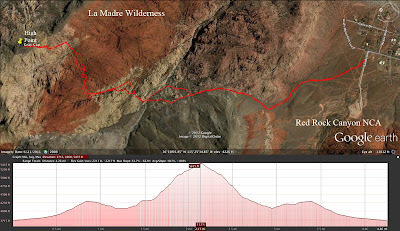 We passed a number of turnoff trails but Chris competently found the right routes and got us back to the loop approach before the heat got too bad. Hiking back to the cars, we were all tired but very happily satisfied with our little excursion to our neighboring state. Until next year, Kingman! And a great big "thank you" to Chris and Diane for coordinating the whole shebang! 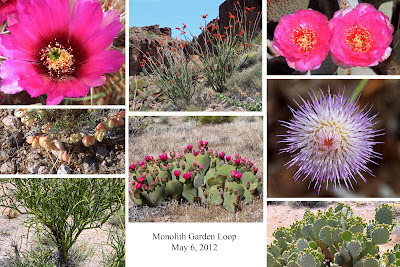 Hiking among the desert blooms.